I found this recipe on the side of a tub of garlic Philly cooking cream. But I didn’t use the Philadelphia product, because of the added artificial flavors and chemicals. I make my own garlic cream as well as added the other ingredients the recipe called for. The recipe calls for pine nuts, and pine nuts provide a good amount of both vitamins E and K. These vitamins have a beneficial effect on the cardiovascular system. Vitamin-K helps form blood clots to prevent bleeding after injury, and vitamin-E helps with producing red blood cells essential for moving oxygen throughout the body. These small nuts also have the trace minerals manganese, zinc, iron, and magnesium. Wow, a lot of nutrition for such a small nut. 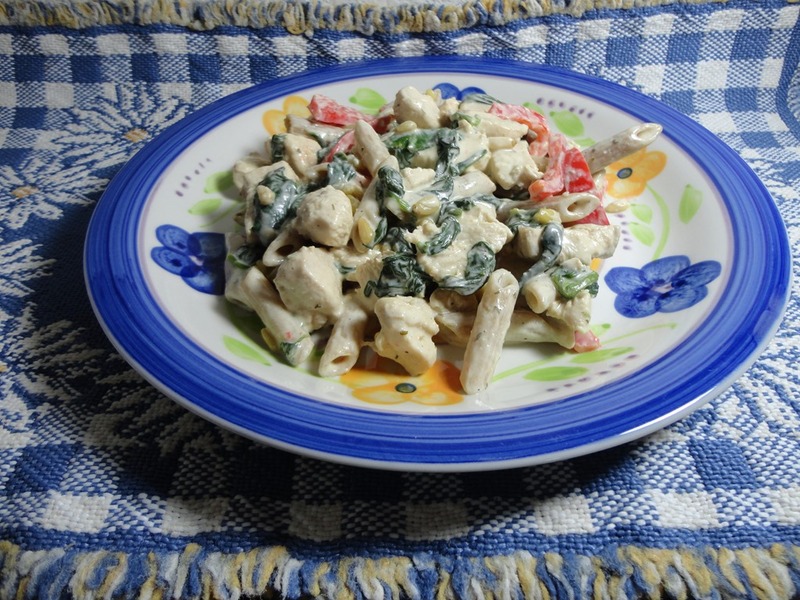 Here is what you will need for the featured recipe – Creamy Chicken Florentine -. First prepare the garlic cream sauce. In a large saucepan, melt butter, add garlic and cook for 30 seconds. Add chicken broth and bring to a boil. Add whipping cream and salt and return to a boil, stirring frequently. Mix water and cornstarch and add to sauce. Reduce heat and simmer until the sauce is thick enough to coat the back of a spoon. After the sauce is made, set aside. Cook Penne pasta; according to package instructions. In a heated skillet with 2 tbs. of olive oil add chicken and red pepper and cook until chicken is no longer pink but oblique in color. Add spinach stir and cook 2-3 minutes or until spinach is wilted. Drain off all but 1 tablespoon of liquid. Stir in garlic cream sauce. Stir until mixed about 6 minutes. Add the two cups cooked penne pasta and mix in. Next add the pine nuts and mix till well incorporated. Remove from heat, plate and serve. If you wanted you can lightly roast the pine nuts to increase their flavor. Roasting them would be done the same as you would roast other nuts, like almonds or pecans. Spread the nuts over a cookie sheet and place in the oven on 350 for about 8 to 10 minutes, stir the nuts once. To add more intense garlic flavor to this recipe, mix 1 to 2 teaspoons of olive oil, and 1/2 to 1 teaspoon of garlic powder with the nuts before roasting them. To learn more about cruciferous vegetables, such as spinach is, link here to the Health News Library and scroll the page to review the articles and add to your knowledge on nutrition. This entry was posted in Chicken, Main Dish, Pasta and tagged Barbecue chicken, Bell pepper, Cook, Cook Penne, cruciferous vegetables, Garlic, Garlic Cream Sauce, Penne, Pine nut, Spinach. Bookmark the permalink. Reblogged this on Meanderings of a Tellurian Metaphorist. Thanks Adrian, it is a great dish and good flavor.